Abstract: This tenth episode stands in the light of Michael Jackson’s anniversary, seven years after his death. 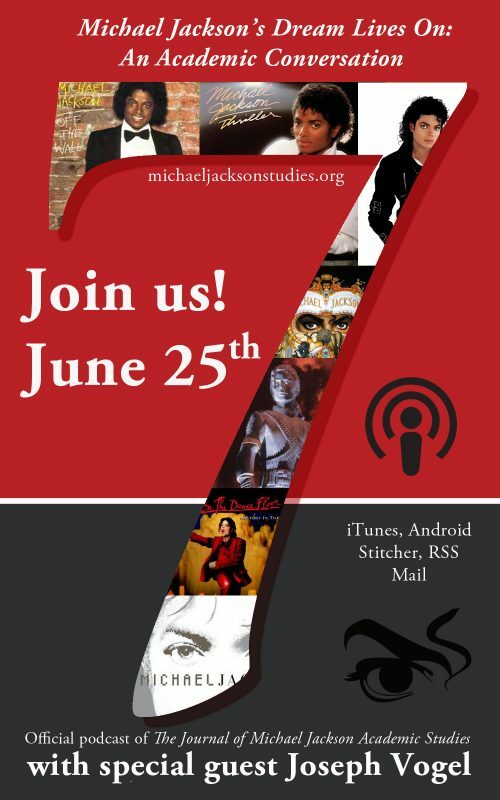 In this MJAS Exclusive, Elizabeth and Karin are joined by guest, fellow academic and author, Joseph Vogel, to discuss the seventh song of the seven adult solo albums of Michael Jackson. They explore the symbolism of the number seven and the meaning of this number for Jackson personally, as well as how, after seven years Jackson’s representation has evolved in surprising ways. They also discuss how Jackson is viewed both academically and culturally. Merx, Karin, Elizabeth Amisu, and Joseph Vogel. 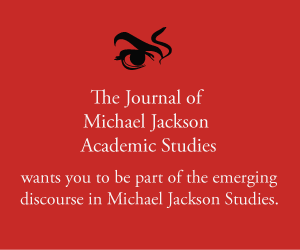 “Episode 10 – MJAS Exclusive: 7 Albums, 7 Songs, 7 Years (with Dr. Joe Vogel).” Podcast, Michael Jackson’s Dream Lives On: An Academic Conversation 2, no. 4 (2016). Published electronically 24/06/16. http://michaeljacksonstudies.org/episode-10-mjas-exclusive-7-albums-7-songs-7-years/. 1. What was the significance of the number seven for Michael Jackson’s art? 7. Last song from Blood on the Dance Floor – Is it Scary? 9. It’s been seven years since Michael Jackson’s death. What has changed in terms of how he is represented and viewed, academically and culturally? Joe Vogel is Assistant Professor at Merrimack College, North Andover, Massachusetts. His research focus is contemporary American literature, Film Studies, popular music, popular culture, and environmental studies. He is the author of several books on Michael Jackson including Man in the Music: The Creative Life and Work of Michael Jackson (2011) and Featuring Michael Jackson: Collected Writings on the King of Pop (2012). Find out more about Joe here. 2. Information about the biblical, and cultural meaning of number 7. 4. Off the Wall (1979), Michael Jackson. 5. Thriller (1982), Michael Jackson. 6. Joseph Vogel, ‘How Michael Jackson Made “Bad”‘, The Atlantic. 7. Bad (1987), Michael Jackson. 9. Dangerous (1991), Michael Jackson. 11. Elizabeth Amisu, The Dangerous Philosophies of Michael Jackson: His Music, His Persona, and His Artistic Afterlife (Praeger, 2016) Pre-Order here. 13. Information on Symbolism in Christian Art. 14. Joseph Vogel, Earth Song: Inside Michael Jackson’s Magnum Opus (BlakeVision, 2012). 15. Academic Book Review of Joseph Vogel’s Earth Song: Inside Michael Jackson’s Magnum Opus by Elizabeth Amisu. 17. HIStory (1995), Michael Jackson. 18. Blood on the Dance Floor (1997), Michael Jackson. 20. Invincible (2001), Michael Jackson. 21. Official website of Charlie Chaplin with information about The Kid.